The Book of Lost Tales, Part Two is the second book in a series of twelve volumes known collectively as The History of Middle Earth. 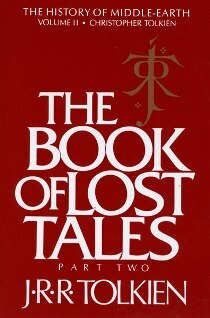 The Book of Lost Tales, Part Two was released in the year following the first volume of the series, Part One, which follows a man named Eriol to the elven isle of Tol Eressea. There, in his travels, he seeks lodging for the night at “The Cottage of Lost Play”, where Lindo, a great loremaster of the Elves, tells him tales of the forgotten history of the Elves. That is the framework of the stories told in The Book of Lost Tales, and Part Two takes up the tales where they are left at the end of Part One. These early prose versions of the tales of Middle Earth were begun in late 1916 – early 1917, when Tolkien had returned to England from WWI France with “Trench Fever”. Tolkien worked on these tales sporadically over the next several years, but abandoned them when he began writing verse versions of two of the tales – “The Lay of the Children of Hurin” and “The Lay of Lethian”. These two long verse poems appear in full in the third volume of The History of Middle Earth, The Lays of Beleriand. The first volume took the history of Middle Earth as far as the coming of mankind, and The Book of Lost Tales, Part Two takes up the tales that later become most familiar to readers of The Silmarillion. Despite their relation to the versions of these tales in The Silmarillion, these tales are nowhere near the final form in which these stories appeared. Many of the tales, particularly those of Luthien & Beren, Turin Turambar, and the Gondolin tales, were rethought and rewritten numerous times throughout Tolkien’s life. The “structure” of the tale – that of “The Cottage of Lost Play” and the telling of the tales to Eriol – was later discarded altogether. The progression of Tolkien’s mythologies is continued in the next volume of The History of Middle Earth, entitled The Lays of Beleriand, where we are given the two long pieces of verse Tolkien composed between 1920-1931.